· Secret Spy Instructions. Make your own super secret invitations to send out to your special guests with special instructions about the undisclosed mission location, party times and the secret password to use to enter the secured party location. Use a simple looking blank card or make an elaborate card out of card stock. Add embellishments and stickers from scrapbook stores like small magnifying glasses, finger prints, fedora hat, etc. · Incognito Gear. Include inexpensive dark sunglasses in the package and tell potential secret agents to come incognito to the party. Tell them to make sure they are not followed by enemy spies and to remember the secret password so they can enter the private party scene. · Signed and Sealed. Put the invitation in folders or manila envelopes that has been stamped with large red letters “Confidential”, “Top Secret”, or “Mission Impossible”, etc. · Decipher the Code. 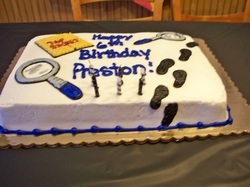 Another option is to leave the location of the party in a secret code and for those who are able to attend the party, mail out a separate code sheet one week before the party and let the kids decipher the party address or location. This way kids can get excited about attending the party before hand and will be ready for bigger challenges on the day of the party. Some examples of encryption would be to use the ancient Egyptian hyroglyphics, write the party details in mirror image, use Morse code or make up your own. I designed the inviations using stencil font of the title, added a few must-be-decipered items, and placed the inviations, along with a business card sized code breaker into a manilla envelope with "confidential" stamped on it. · Famous and Infamous Spies. Get posters of famous spy movies like James Bond, Spy Kids, Mission Impossible and Casino Royale, etc. and decorate the walls with them. · Fingerprints. Get fingerprint stickers and stick them on cups, tables cloths, and any surface you can find that makes them easily removable. Another option is to print out the prints on plastic removable adhesives so that you can also stick the prints on windows and glass. · Silhouette Targets. Put up black silhouette targets all over the party room as party decor which you can use later on for the “Target Practice Game”. · Yellow Tape Outline. If you can find yellow tape that is easily removable, use it to outline the body of a person on the floor as part of a crime scene. · Footprints Clues. Stick footprints everywhere using contact paper leading in various directions. · Password. 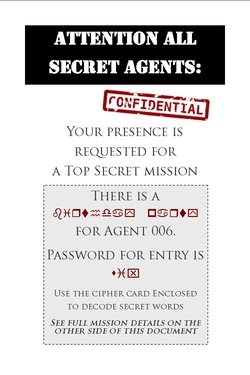 If you have mailed out a secret password to enter the secret spy academy (party location), ask your guests what the secret password is before letting them enter. · Fingerprinting. Add fingerprints to the badge as well. · Dark Sunglasses. An instant inexpensive dress-up item to go with their photo ID is dark sunglasses. · New Identity Assignment. Memorize details of a new identity. Whoever remembers details of their new personality at the end of the party, gets a prize. · Incognito Disguise. Don’t forget to put a trunk full of Fedora hats, Sherlock Holmes hats, stick-on-moustaches and dark sunglasses for your guests to wear as the enter the party room (or Spy Academy, Spy Headquarters, or go on their mission). · Spy Movies. As kids are arriving, you can play a movie for kids to watch while they wait for others to arrive. · I Spy Books. “I Spy Books” are also a great way for guests to keep occupied as they wait for the party to start. · Detective Game. One child leaves the room and the rest are seated in a circle. Another child is designated to be the leader and subtly and quietly, without being seen, makes a subtle movement. The rest of the group has to copy the movement but try not to look at the leader so that they will not give away the secret. When the child returns to the room he has to guess who is the leader. If he or she guesses correctly, he gets to stay and the person who was the leader has to leave the room. Continue playing for several rounds. · Night Time Break In. Find a large box, e.g. from an appliance store, and decorate it to look like a safe. You can use duck tape to attach a temporary latch hinge and even close off the box with a lock and key. Take several old keys and paint them with glow in the dark paints, together with the actual key for the lock. Turn off all the lights and place several glow-in-the-dark objects all over, like balls, ducks, and the keys for the secret agents to find. Use Night Time Surveillance Equipment for each kid or have the kids take turns with several head sets. Use glow-in-the-dark pens, chalk, paints, etc. to write messages, instructions and clues on paper, floor and cardboard. If you have a laser light you can place them low to the ground to make them look like laser beams for an alarm system. Kids will have to step over or crawl under the lights. Caution: if you are using laser beam lights make sure they are wearing sunglasses or do not directly look into the laser beam. For added fun, add spy motion detectors that will sound off if motion is detected in certain rooms. · Morse Code Madness. 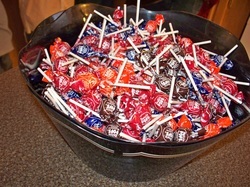 Hide the favors in a hidden location and give the kids clues that eventually will lead to the favor bags. Have all the clues coded either in Morse code or invisible ink, and give them each a sheet to decipher the clues. Have each clue lead to another clue in a different location. Leave this treasure hunt for the end right before pick up time. · Disguise relay. Fill 2 large suitcases with costumes, hats, sunglasses, shirts, etc. You can just get items from your own closet or go to a thrift store. The funnier the outfits the better. Divide the guests into 2 teams and have them lined up in a line. On the count of three, first one on each team races from one end of the line to the opposite end where the box is located. Each person must put on a top, bottom, hat and sunglasses. Then they race back to the starting line and take off their clothing, and hands them to the second person from their group. The second person has to do the same as the first person, etc. Play upbeat fun music from any of the popular spy movies. The team that finishes first, wins. · Mission Impossible Limbo. Who here remembers “Mission Impossible“? Play that catchy tune and do the limbo for a quick leg-shaking-back-bending fun time! Make two supporting columns and use thick wire attached to the two posts instead of the limbo stick. Tell the kids that this is an electric fence and under no circumstances can they touch it otherwise they will be electrocuted. Continue moving the wire lower and lower. Finally, place the wire so low so that all secret agents must use a low military crawl on their back or using their elbows, while holding a toy weapon, to inch themselves forward! The last one who is able to go under the wire without touching, wins! · Who Am I? 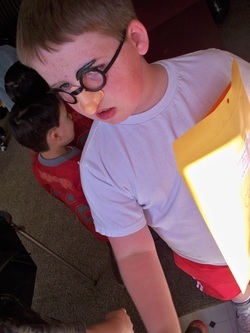 Before the party, write names of favorite movie, book, or cartoon spy characters on 3×5 cards. To play the game, tape a card to the backs of each player. Don’t tell them who is on the card. They have to ask other players questions about the who, where, what and hows, until they figure out their character. · Pass The Dynamite. 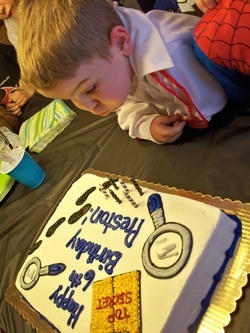 This one is a great birthday party game from the blog Domestic Diva (see picture above). She made a stack of dynamite by wrapping paint rollers in red tissue paper. Wrap the rollers together with black electric tape and add in electrical wiring and timer that actually ticks! Turn the timer on a few seconds and pass the dynamite around like the game “Pass The Hot Potato”. When the timer rings and the bomb goes off, the person left holding the dynamite is out! · Stomp The Bomb. Get lots of black balloons and blow them up. Attach a piece of rope to each one with a piece of tape to look like a fuse. Place them all in a small room. Put on some fun music and tell the secret agents they have 1 minute to diffuse the bombs and have them stomp them out as quick as possible! · Sherlock Says. This game is played like “Simon Says” but instead of “Simon” use the name “Sherlock” or the name of the Birthday child. See which spies can undergo this rigorous training and follow directions to the “T” and last the longest. Some directions to give out can be for example: “Raise your right hand”, “Stand on one leg”, “Touch your nose”, “Pull your left ear”, “Scratch your head”, “Walk backwards”, “Turn around counter-clock-wise”, etc. · Under Cover Identity. Part of being a top secret spy is to be able to assume a new identity in a short period of time. This game will prepare the secret agents to become top notch spies with their new presumed identities. Use index cards and write down for each guest attending new identities. Some statistics you can write down are for example, a new Name, Gender, Birth date, Birth Country, and Profession. Option: Add in Favorite Color, Favorite Food, and Favorite Pet Animal. You would need to have the same number of new identities as guests present. Have the guests read over and memorize their new given identities for maybe 5 minutes. After 5 minutes is up, stick the index cards on the back of the guest. Have all the spies walk around and quiz each other to see who can remember the most facts about themselves. Whoever has the most correct answer, is the winner. · Spy Academy Obstacle Course. This is a great birthday party game during the summer time, outdoors. You will need (1) construction cones, (2) old tires, (3) small wading pool, (5) small tunnel, (4) large obstacles like appliance boxes, or even a (5) rent a bounce house with climbing obstacle course and slide. Create the obstacle course for the spy students using any or all of these objects and have different stations for each. At the beginning of the obstacle course, give each spy student a plastic water gun, sunglasses and a hat. They must not loose any of these objects during the entire course. Place construction cones in a straight line and have the spies zig-zag in and out as quickly as possible between cones. Put out tires for them to jump through, have them crawl through a tunnel, climb over obstacles, do 20 jumping jacks, go into the bounce house, then do 10 suicides, step over water in the wading pool (bare feet), and then roll down a hill to a target practice area where hanging balloons are tied to a string. With their water gun they have to try to shoot and move one balloon from a distance. Time each guest and see who has the shortest time. · Do you read me, over! Get a voice scrambler and have someone talk with it. Have the other kids sit around in a circle and see who can figure out what the person is saying. Whoever gets it right, gets to wear the voice scrambler next. · Target Practice. Make human silhouette cutouts out of foam core or card board. Paint them black and use white paint to outline target regions. Place behind a layer of plexiglass and use as target practice with suction cup darts. Another option is to play this game like “Pin the tail on the donkey”. Blindfold kids and let them use stickers to see if they can stick them closest to the bulls-eye. Fingerprinting: Using washable ink pads and index cards, have your guests take each other’s thumbprints. Make sure to have a box of hand wipes ready to clean their fingers afterwards. 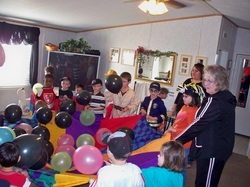 Destroy the “Bombs”: Fill black balloon “bombs” with air (not helium), and tell the children to destroy them all. Stand back and watch the fun as the children sit or stomp on the balloons to destroy them! I Spy: This classic game is perfect for a spy-themed party! Start with the birthday child, and let him/her secretly choose an item in the room. Then have him/her tell your guests “I Spy something [give the color of the item].” One at a time, let each guest try to guess the object the birthday child has chosen. Whoever guesses correctly gets to choose the next secret item. Listening Skills: Have all of your guests sit in a row with the birthday child on one end. Before the party, choose a message for the birthday child to whisper to the child next to him/her. Each child whispers the message on down the line, and the last child announces to everyone what they heard. If they get the message right, they all passed their listening training! If they don’t get the right message, they’ll all be laughing at whatever the message has become! Secret Code Breaking: Make a simple code by assigning the letters of the alphabet to random numbers. Write a message in code on index cards before the party, and pass them out with pencils when your guests arrive. 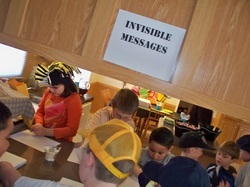 See if the children can decode their secret messages. Alternatively, you can give each of your older guests a copy of our Crack the Code Cryptoquiz puzzle. Print a copy of the answers as a reference, too. If any of the children have trouble with the puzzle, give them one of the letters or phrases from the answer sheet to get them started. Who Am I? Game: Write down the names of movie and cartoon characters the children will know on index cards. Have all of the children sit down, except for the birthday child. Tape a name on the birthday child's back, and have him/her stand with his/her back to the group so your guests can read the name taped to his/her back. Then, he/she must ask the group yes or no questions until correctly guessing which character he/she has been assigned. Let everyone have a turn. Appropriate characters for this game may include Shrek, Cinderella, Harry Potter, Tinker Bell, Aladdin, Mr. Incredible, James Bond, etc. Secret Agent Obstacle Course: Tell your guests that secret agents need to show strength and speed. Set up an obstacle course in your home or yard using everyday objects like a wooden board "balance beam", a nylon tunnel, a play fort or small tent as “enemy headquarters”, a slide as an “escape chute”, hula hoops set on the ground, bean bag chairs to jump over, etc. Memory Test: Fill a tray with 10-15 items a spy might use, like a passport, binoculars, a camera, a watch, a magnifying glass, an inkpad for fingerprinting, and so on. Let the children study the tray for about 15 seconds, then cover the tray and remove one item. Bring the tray back, uncover it and ask your guests which item is missing. When someone guesses correctly, start the game over. If desired, you can award a small prize to each child who guesses correctly. Satellite Photo Identification: Print overhead satellite photos from the internet of familiar places such as your house, your child's school, a local grocery store, a baseball stadium, your guests’ homes, etc. Show them to the children one at a time, and let your guests try to identify them. They will be especially excited to see their own houses! Use Google Earth or another website to find the photos. Writing an Invisible Message: Before the party, prepare a bowl of lemon juice and gather up some cotton swabs, such as Q-Tips. Let each guest dip a Q-tip in lemon juice, use it to write a message on a piece of paper, and then let it dry. To read their messages, the children must hold their slips of paper up to a warm light bulb or candle, being careful not to burn themselves or their papers. After a moment, the lemon juice will darken and reveal the messages. 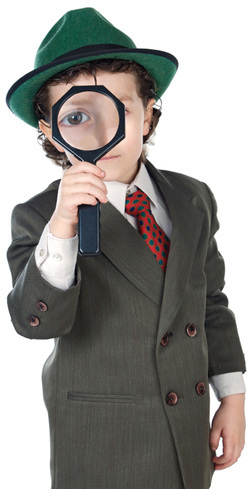 Following Clues: All spies need the ability to follow clues! Tell the children an enemy spy has stolen their goody bags! Make up clues before the party, and hide them in the yard or party area. Hand the children the first clue, and let them start searching! Each clue should lead to another envelope containing a clue. The final clue should lead to the stolen goody bags. You can substitute a piñata or the birthday cake as the stolen item, if you prefer. 1. What a secret agent does: look carefully use their minds gather information keep secrets help other agents go on missions to help catch the bad guys! and an the outline of the "training" for the day Secret agents: fingerprint training footprint training decoding secret messages physical training Also told the kids that they would receive "tools" that secret agents use to help them do their job. 2. Fingerprint training: I had made a poster using fingerprints and hand prints of myself and my children in ink, in different materials (paint, chocolate sauce, mustard). Each child received a magnifying glass, pen and pad of paper; we talked about how fingerprints are unique to each person, can be whole or partial, can be in different materials, etc. 3. Footprint training: I made a poster using different shoes we had in the house (rolled ink on the bottoms and presseed them on the posterboard). I had the shoes there so the children could compare the bottoms of the shoes with their prints; we talked about adult vs. children's sizes, different kinds of shoes, sneakers, sandals, high heels, and left and right foot slantings. Each child received a small flashlight. 4. Decoding Secret messages: I made another poster with pictures of an invisible ink pen (clip art), red ink code (in word, red confetti over light blue letters), a SCYTALE (pictures from the web - a decoding tube used to send secret messages). We went through how to use each decoder: - Each child received an invisible ink pen - bought from Oriental Trading co - 2 part [en - 1 end was the invisible ink writer, and the other was the marker that you used to scribble over the message and read it. - Each child received a red ink decoder band (I made these using blue and green pool "noodles" - I cut them into 2 inch bands so they could go around a child's wrist - used white cardstock paper cut into strips and folded and stapled exactly like a matchbook. I cut a square hold in the "cover" of the "matchbox" and glued red cellophane on the inside of it, so the kids could lift up the cover, put their red ink clue in it and read the secret message. I made sample word messages for the older children, sample picture messages for the younger kids who couldn't read yet - again in MS word, print out light blue lettering or pictures, then print red confetti background design over it. (This took a lot of time and experimenting to see which color blue and which pictures would work so they wouldn't be seen, but weren't so dark that they could be easily seen, etc.) - Each child received a scytale (which I finally found out is pronounced sitalee - short i, short a, long e) which I made out of paper towel tubes - wrapped in blue or green construction paper, then laminated with clear contact paper. I had an old roll of light blue computer paper which I cut up into 1 1/2 inch sections - needed to be about 2 feet long. This strip of paper is wrapped around the scytale (I marked off the starting and finish point in pen with a line and an "S" and "F" to make it easier for the kids to understand). The you write your message on the paper while it is on the tube. Once you take the paper off the tube, the message is gibberish, and can only be read by someone having the same diameter scytale. I had made a sample message for each child which read "WELCOME TO SECRET AGENT TRAINING!" for them to see how it worked; I also included extra blank strips if the children wanted to make their own messages later. · Meatball Grenades. Make Swedish or Italian Meatballs as appetizers and place on a decorative tray. Cut short and thin carrot sticks, red peppers or very thin celery sticks and stick into each meatball to make them look like fuses. · Mini Pink Panther ‘Emburgers’. Serve Pink Panther’s detective Jacques Clouseau favorite food – the hamburger or pronounced ‘emburger’! · Mini Pizzas. Serve pizzas in miniature versions for the hungry and on-the-move secret agents. · Vodka Pretendini. Serve Sprite or Seven-Up in martini glasses and pretend they are Vodka Martinis, the drink of choice of James Bond. Serve them shaken, not stirred as he prefers them. Mystery Munch - Prepare a snack mix of yummy foods like mini-pretzels, tiny fish crackers, M&Ms, mini marshmallows, and gummy candies. Kid-favorite hot dogs become Detective Dogs. Set out a Secret Agent Snack Tray of cut-up carrots, celery, cheese, crackers, and veggie dip for your sleuths to nosh. Spy Salsa is simply tortilla chips and salsa. Bomb Grenade Cake. Make a round cake and decorate with black icing. Add a sparkle candle on top (the ones that don’t blow out or trick candles). · Magnifying Glass Cookies. Make magnifying cookies by sticking a candy cane stick to a round sugar cookie using icing. Decorate the top of the cookie with white or ivory fondant. Outline the circle in black. · Truffle Bombs. Make or purchase round chocolate truffles, and place small mini candles in each one and light them up before serving. The truffle bombs can also take place instead of a birthday cake. · Binoculars. All spies need binoculars to scope out the scene and to observe their suspects from afar. · Dark sunglasses. Dark sunglasses makes easy instant disguises and are a must for the top secret spy agents. · Magnifying glass. Another essential item for the secret spy agent is the magnifying glass. · Squirt guns. Great on a hot day when the kids are running around the back yard. A great cooling alternative (inexpensive too) to laser tag. Make sure guests have a change of clothing or wear bathing suits to the party. Let kids take home the squirt guns after the party is over. · Spy stickers. Spy stickers are always a hit and makes great favors for goodie bags. · Spy backpack tags with custom personalization. Have custom spy tags made for each spy. Great practical favor that can be used for identifying backpacks, sports bags, or luggage. · Glow In The Dark. Glow in the dark toys, balls, duckies, slinkies, etc. are always a hit at birthday party favors. · Spy Pen. An invisible writer spy pen makes a great theme party favor. · Target Practice Key Chain. A target practice key chain for the backpack or keys makes a practical favor. 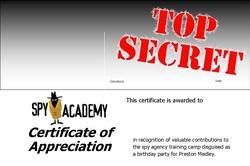 After the Party, included in the thank you note for the gift, each friend received a Secret Agent Certificate (made on the computer), "This certifies that Agent (child's name) has completed training at the Secret Agent Training Academy. Good luck on your future missions!" Each certificate had that child's photo on it from the party.